BrakeAudit's drive-through automatic brake inspection systems issue alerts when brake problems are found. Reduce fleet TCO by optimizing PM schedules, reducing accidents and roadcalls, and lowering insurance premiums. Automate eDVIR, platooning, and autonomous vehicle braking model updates with current brake conditions. Every 5 minutes someone is killed or injured in a tractor trailer accident. Thirty percent of these accidents involve brake failure. 15% of all trucks and buses inspected every day are taken out of service due to faulty brakes. 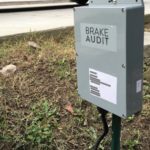 BrakeAudit provides drive-through automatic brake inspection systems used in fleet management, inspection screening, eDVIR, and autonomous vehicles and platooning. Your brakes are trying to tell you something – Listen to them! 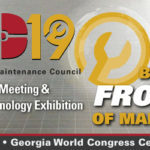 Visit us at TMC’s Annual Meeting, March 18-21 - Visit us at TMC’s Annual Meeting in Atlanta, March 18-21. Booth #3224. The Technology & Maintenance Council (TMC) Annual Meeting & Transportation Technology Exhibition is home to trucking’s leading fleet professionals, vehicle manufacturers, and component suppliers. 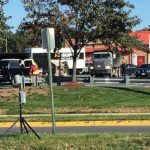 BrakeAudit Participates in Law Enforcement Campaign - October 25, 2018 – Bethesda, MD. BrakeAudit participated in a one-day enforcement campaign with the CMV Enforcement Divisions of several law enforcement agencies in a major mid-Atlantic state. Several vehicles were found with bad brakes and placed out of service. Visit us at CVSA’s Annual Conference and Exhibition, September 23-27 - We’ll be at booth 5 – let us know if you’d like to schedule separate meetings. 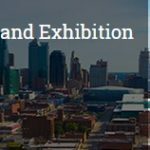 This year’s CVSA Annual Conference and Exhibition is Sept. 23-27, 2018, in Kansas City, Missouri. Truck Safety inspectors with the LCSO & six other law enforcement agencies from the region conducted a joint traffic safety commercial motor vehicle enforcement in the area of Shaw Road $ Old Ox Road. Over 65% of the trucks inspected were taken out of service. Found both driver axle pads cracked on this dump truck. Beautiful spectra!